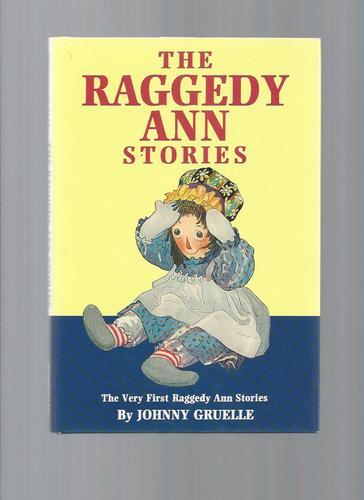 Being that the copy of the book we found was labeled "the very first Raggedy Ann stories" I decided to pick it up and try it out on Bookworm1 (age 6). As we read it, Bookworm2 (age 4) climbed up and nestled down to listen. Also Bookworm3 (age 2) sat down and listened to most every story! (That's an amazing feat for her. She's been the slowest to learn to love books. But she's coming around and I haven't panicked like I did when Bookworm2 didn't take to books right away. You freak out less as you mother on.) So, while I thought to share this book with only one of my kids, we ended up reading it in two sittings all together. Everyone enjoyed it and so it was lots of fun to read! All of the stories are on the long-ish side but, as I say, that didn't seem to bother any of my kids. There are plenty of pictures spread throughout of this cloth doll with shoe button eyes and a wide smile. If you are unfamiliar with the stories, Raggedy Ann is a home made doll who belongs to a young girl named Marcela. Although Marcela has many fine looking shop dolls, Raggedy quickly becomes her favorite as well as the favorite of all the other dolls in the nursery. These stories tell of the adventures that Raggedy and the other dolls have when they are left alone. She's a cute (mildly creepy), fun doll and a good friend to the others. These stories were fun to read. As I was preparing to write up this post though I looked up some information on the author and character and discovered something that I thought was quite interesting! Johnny Gruelle was a free-lance artist first (he illustrated all of the Raggedy stories himself). The story goes that in the early 1900's he found a doll in an attic which he drew a face on and gave to his daughter, Marcella. She loved it so much that Gruelle thought other children might also and so he patented Raggedy in 1915. Shortly thereafter he began writing stories about this little doll, the first set of stories being published in 1918. When Marcella was 13 she was given a small pox vaccination at school. According to some websites, a second, unidentified vaccination was given to her without her parents' consent, which resulted in Marcella contracting diphtheria and she died. However, most websites seem to indicate it was the small pox vaccination itself that cased her death. Either which way, understandably, Gruelle was devastated and he kept Raggedy around him for consolation. And here is an interesting article discussing the history and legend of Raggedy. A curious character, to be sure! Unassuming at first, but with a great history attached! I was not aware of all the history there. Thanks for looking it all up for us. We had at least two of the longer books when I was a kid. I remember Raggedy Ann and Andy and the Camel with the Wrinkled Knees and Raggedy Ann in Cookie Land, but we may have had more. I hadn't grown up reading about her, either, though I was vaguely aware of her. We bought a few inexpensive books of her when the kids were young and we all enjoyed them. The Camel with the Wrinkled Knees was one of my favorite characters. I hadn't known the backstory - so sad about Marcela dying so young. Ahh, what a walk down memory lane! 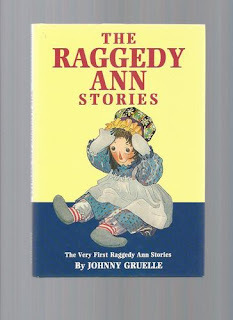 I loved Raggedy Ann and Andy as a little girl, and still have my paper dolls. Ok, this information is fascinating. Just fascinating! I loved these stories when I was little. In fact, this post made me want to read them again. And yes, she IS a little creepy looking.